Ideal for baking and keeping your kitchen hygienically clean, granite countertops in West Kirby are available in many colours. The most popular colours are white, pink and gray. This is the background colour and the secondary colour is usually quite eye catching. A white and green counter top or a pink and gray granite top is very appealing. 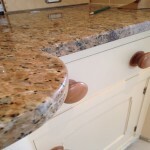 There is a vast selection of colours with granite, more so than with many other stone work tops. The stone is incredibly durable and you can put hot pots from the stove onto the counter top with no damage being caused. Once the stone has been sealed there is no way that mould or bacteria can grow on your countertops. A quick wipe with a damp cloth is all that is needed to clean the stone. Most home owners would love a new kitchen. In West Kirby, granite countertops are one of the things a new kitchen has to have. The granite always looks clean and shiny and is wonderfully cool for anyone who likes to bake. Granite has been tested along with other materials to gauge the suitability for use as countertops. It scored very high and was highly recommended as the perfect material to use. Each stone is unique and unlike many other materials and stones it is resistant to most of the damage that occurs in a kitchen. Water resistant, stain resistant and it does not score or scratch and there are few other materials that can boast such quality. We supply the best granite countertops in West Kirby. Contact David Williams today or visit our showroom to view the spectacular range of granite stone we have in stock. For over 50 years David Williams has been working with stone and was trained as a stone mason. This is a very rare profession these days as the apprentices worked the stone by hand. This has given him an innate feel for different stone types and he has perfected the art of stone carving. The family run firm has six other craftsmen to ensure you get only the very best service. We know stone and will ensure that your worktops are expertly fitted by our well trained team of installers. This entry was posted in Granite and tagged Granite Countertops in West Kirby, West Kirby Granite Countertops. Bookmark the permalink.